After travelling through Australia and NZ I started working in an Outback pub in Thangool, QLD and I really had the time of my life! Finally the real deal!! I was supposed to stay a month and ended up staying for over 3 months! A friend of mine, from Holland, had worked at Dululu Hotel (one hour inland from Rockhampton). I rang the owner when I was in Rockhampton, and he told me he'd sold the pub. But he said he would call a friend who owned a pub and might be looking for a backpacker... 24 hrs later I was picked up from Biloela (where I arrived on the school bus) to work at Hotel Thangool. There is no better way of getting to know people than to have a beer together. The owner, Kevin Mauger, and his family are all very good at playing guitars and singing, so we had a lot of songs going on. The ice was broken and the great months at Hotel Thangool started! Thangool centre is one street with a post office, a couple of houses and two (yes, two) pubs. A bit further is also a small airport and a horse racing track. The people in Thangool (the visitors or "locals" of the pub) all work at the Callide mines of Biloela or at a kettle station, and you could say they are Crocodile Dundee types of people! Very nice!! The pub-family and some friends showed me around a lot. We went to the volcano called Mt Scoria, and of course I slipped and fell on my way back, and of course 70 yrs old Uncle Fred didn't, even though he climbed it wearing thongs! We went to Kroombit tops (a very non-commercial holiday park), to the horse races, just everywhere! Working at the pub was easy. Except for Fridays there was not much to do. Only on Fridays everyone from around Thangool would come in for the raffle and it would be busy, but that was about the only time you needed to be behind the bar with the two of you. It is great to see yourself get to know your customers. You see a car and you know what beer you have to make and where to put it. People drink their glass almost empty and leave it standing on the bar, so you know you have to get them another one. You don't have to waste time asking if they want another one, or asking for money as the money is also on the bar. You just take some and put the change back! When they are really finished drinking, the lay their glass (flat) on the bar and you know they're going home now! It's just fantastic that this still exists; people who trust each other and not everything around you needs to be hidden or locked. At the beginning the female locals were not very nice to me, because I could be the next backpacker that ran away with their husbands. But after a while they finally understood I had a boyfriend overseas and was not planning on spoiling any marriages, which made those women much friendlier :-)! During my stay I worked, learned the slang of the town (it was pretty hard to get rid of the F word afterwards), played pool, sang along with the Mauger family, decorated the pub here and there, borrowed a pushbike (also amazing: when I was pushbiking to Biloela everyone would stop to ask if I was ok, if I needed a ride, etc. They just couldn't believe I did it because I wanted to! So funny! ), had staff parties (which meant that the owner and I "got on the piss"), went out once in a while in Biloela (live music, strippers, pokies), drank a lot also during work, but most of all made really good friends over there! It is so good to be out there and meet the REAL locals instead of only the other 20.000 backpackers in the hostels on the east coast! And you see the country and a basic way of living. People don't need much to be pleased and happy with their lives! 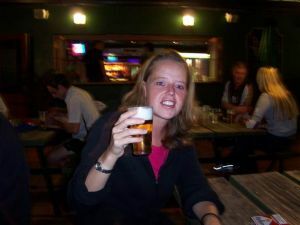 Well, for the dutchies: my stories from my stay in Australia (including my time at the pub) are still online at http://helene.aroundtheglobe.nl. They are, unfortunately, only written in Dutch! Since I came back a few weeks ago, I have been writing the new stories in English, so for my new Outback adventures, everyone is able to follow me (not many stories yet, but there will be a few later)! I liked the story about your time in Thangool. I was there on an exchange in 1994 and it looks like it hasn't changed one bit. Waauuww...Very nice and cool. Hey, why don't you go to work as a journalist - ?? Greetz, your sister from Holand. Glad to know you had a good time. That's the only pub where you have cats, dog and feral kids. It's the friendliest pub in oz. I also worked in Thangool 25 years ago as an ag student from the UK. It's a great place and I have very fond moments to remember. What a fantastic attitude you have. I'm so pleased you had a good time working outback. I've come across so many backpackers who have this sense of entitlement that it really makes me wonder why they come out here. But not you. I thoroughly enjoyed reading your article. This is a good story but only one side of working in the Outback. I think it is very irresponsible of this site to list only the positive side of working bush when, in reality, there is also a dark side and one that takes advantage of the unwary traveller. It's wonderful that the site owner has had a wonderful time leaving Germany and finding work here but it's not all hunky dory as she suggests. There are MANY people out there who will offer jobs to travellers only to mislead and mistreat them. A lot of people, myself included, have run into people who will resort to any means to extract money from you or to put you in situations you are not equipped for. Like any country, you MUST be careful with where you go and just because Australia appears friendly and the kangaroos look cuddly doesn't mean it really is that way. I urge everyone who reads this site to take it for what it is, a site that sells dreams. Wow! That's the life I've been hankering for. I just gotta find my way there soon. And the outback is something else! Hi, my name is Ratu Manasa Tagivakatini. I am Fijian man, age of 44, call me to Australia in the farm fruit picking. Call me today in my mobile number +679 9272726/ +679 8669721/+679 3215211-work. Hello... I'm from Solomon Islands and I have fews friends who we are goodworkers in small jobs like gardening, cleaning, piggery, carpentry and poultry etc...we would be much grateful if any one is willing to take us to work for him/her in any handy jobs. Due to excessive rain, the arid deserts will once again go green. It's time for more sheltered accommodation with banging ceilings. Adactus said you can have laminated floors, God help the sleeper below. Imagine all the wet deserts in down under being filled with sheltered accommodation full of moaning ole gits saying "what more rain in aussie cannot get out to use my free tour bus pass. In Liverpool, the ole gits write their names on the arriva seats "that is my seat as I sat here last night" cripples run on the arriva just to claim their seats, should you sit on the wrong seat, some ole git shouts, warria lookin at that's my seat I always sit there watching who is gettin on most of these sad bus pass holders should be dumped near alice springs, come the night the cold g/day sport. Peter, this is the experience of one person. If anyone is naive enough to believe they'll have the exact same experience, then they're dreamers and will find out the hard way, which I hope won't be too hard of a lesson to learn. The writer was very fortunate, but she went about her adventure by the aid of a friend who did own the pub at one time and recommended her based on the mutual friendship, not exactly the same as pulling up on your bike and asking for a job. I'm a bit over cautious myself, but I'm not paranoid. By the way, I did see the movie HOSTEL, so I certainly believe in the possibility of the horror's a young woman or man could face if they aren't paying attention and listening, being aware of their surroundings. What a nightmare. As for the other two fellows, seriously, did you think this is a board for finding work? Nitwits. I have lived for two years in Woorabinda, about 100 km from Thangool. The latter is NOT the outback by any stretch of imagination. The outback starts well beyond there at places like Charleville, Longreach, Mt. Isa and Cooktown in Queensland. In New South Wales west of Bourke and Cobar, in South Australia north of Wilpeena Pound and west of Ceduna, in Western Australia east of Kalgoorlie and north and west of Geraldton and in the Northern Territory east of Darwin and south of Katherine. Thangool and nearby Biloela are nice small country towns but o/seas tourist should be given correct information about where the Outback starts.